Shapeways printed HO scale Klasing brake wheels. We kick off a new blog feature with this photo. Every now and then an image will show up on Wednesday for a look at something on our workbench. 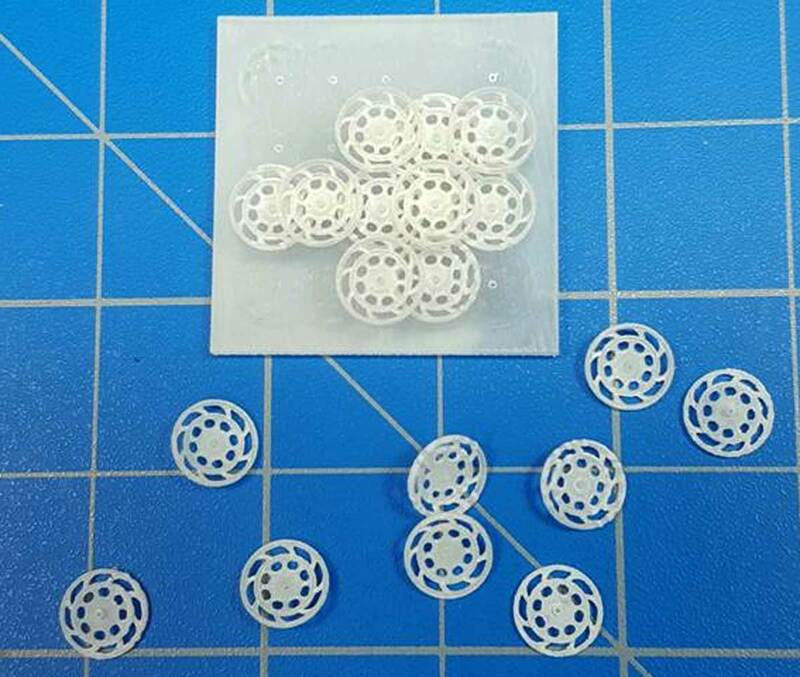 The photo could be for an upcoming kit, or model progress by one of our RCW minions, or something cool we found, like these Klasing brake wheels on Shapeways. I am sure this has been asked and answered several times. You tube has many choices. I have several Funaro and comealong kits, I need to prep for painting. Best choice for release product? How long submersed? Thanks in advance. Ron S.
Ron, the F&C kits recommend washing the model using Shout to remove fingerprints and mold release. I use a soft bristle toothbrush to scrub the model and then rinse thoroughly. Do not submerge box cars or enclosed cars. Good luck with the prep and painting! – Eric H.